Installing under cabinet lighting is an easy way to reduce the amount of power used in your kitchen as well adding dramatic mood lighting to the overall atmosphere. Although the best time to install the wiring required for under cabinet lights is while you remodel the kitchen (ideally before the drywall is installed), it is possible to add under cabinet lights to pre-existing kitchen cabinets, eliminating the need for a disruptive wall tear-out. First you need to find out a few key details. If the plastic-sheathed cable is subject to abuse, the National Electric Code requires it to be protected. Double check with your local electrical inspector to see if that is the case; if it is, use a flexible steel conduit (known as “flex”) to run the cable through. 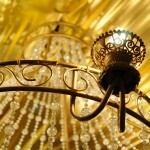 You will also need to find a source of power to provide the 120 volts required for the lights. Unfortunately, you cannot use countertop outlets (or any 20-amp circuit) because of the electrical code. The best options are a junction box (in the basement) or a hallway outlet. 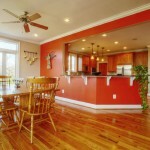 You will also want to make sure the under cabinet lights do not overload the circuit. This process can be tedious, but it is necessary and important. You can test this by shutting off the selected circuit in the main panel, and then turning on all the lights in the house. 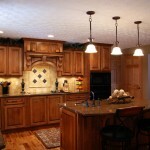 Add up the wattage of everything that doesn’t turn on, and then add the wattage of the under cabinet lights. Make sure the wattage does not exceed 1440 watts for a 15-amp circuit, or 1920 watts for a 20-amp circuit; if it does, you will need to find another power source. Determine which cabinet will be the base you run the power into. Locate the outlet position in the cabinet by chucking 8 inches of coat hanger wire into your drill, and drilling a hole beside the outlet through the backside of the cabinet. You will then want to mark a 12-in. square before cutting a hole behind box. Screw the junction box to the back of the cabinet. Drill 1-1/8in. holes through the cabinet sides, and run ½-in. flex for each light, switch, and power. Ream the end of the flex which is cut to make sure the burrs are removed, and install flex connectors on both ends. Pull the plastic-sheathed cable through the flex. Once the cable is in the flex, you will want to drill multiple holes in the back of the base cabinet, as well as in the base of the wall cabinet, before cutting a hole for the switch. Finally, use your saw to ream a hole through the back of the cabinet to provide the flex with a better fit. Push the end of the flex into the wall and secure with straps every 4-1/2-ft., and within 12 in. of every hole and the junction. It is now time to mount and connect the light fixtures, and to connect the wires in the switch box. You will want to secure the cable to the fixture by using a cable clamp. Follow the instructions provided to connect the wires. Attach the fixture to the cabinet by screwing it into place, and cut a hole for the switch. If possible, install a dimmer as opposed to a regular switch. Follow the instructions to connect the dimmer, and complete the wiring by attaching the new wires to the existing wires in the outlet box (make sure to connect black to black, white to white, and the bare ground wires). Install a metal cover plate by screwing it to the junction box, and close the hole in the back of the cabinet by screwing over the opening an oversized square of plywood. Finally, reinstall the outlet to complete the renovation.